Your task as an instructor is to energize learners to do the work they need to do to learn. We do that through active learning: experiences like team-based and case-based learning. And we do that in the classroom through lecture. 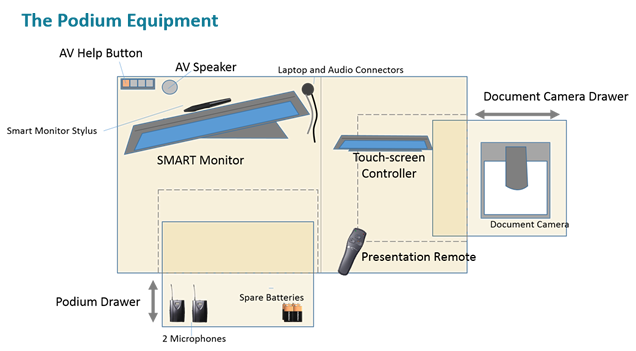 This section introduces you to our MD Program classroom technologies. Our larger classrooms at EVMS are equipped with amazing instructional technologies. The job aid below is designed to 1) introduce you to them, 2) provide ideas for when they may be used, and 3) walk you through their use. One of the most important things to know about our classrooms is that you will be well supported. The AV technician should meet you 10 minutes prior to class and stay until the lecture has proceeded for a few minutes. Help is always a button-push away. Each podium is equipped with an AV Help button. When you press it, the AV Room Controller will speak to you via a two-way system. You may also dial extension 0556 whenever you need assistance.